Some leagues allow players currently on a team to play for other teams. Select John Doe from the list. Click the Swap Position button. 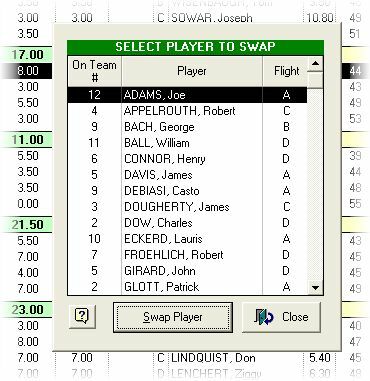 Select a player (that will not play) on team #4 to swap with. John Doe will now appear on team #4 for this event. Any points a swapped player wins are attributed to the team he has been swapped to. The Team column (on the main list) will display T# to indicate the team the player usually resides on.